Looking for Adventure tours in Ocho Rios and Runaway Bay? Here are a few amazing tours that you and your family can enjoy. One of the first stops might be at Chukka Caribbean Adventure Tours, as there are several packages to choose from such as zip-lining, horseback riding, all terrain vehicles and cliff jumping, or there is the Good Hope Ultimate thrill for those staying in Ocho Rios. You get to travel around a 2000-acre estate, dip into history during a Great House Tour and if you want float down a river in a tube or go Kayaking, oh yes and you may want to try swimming on horseback in the sea. There are other tours offering Safaris to the Blue Hole and lunch, or the Chukka Cove Zion Bus trip to Bob Marley’s birthplace and final resting place in the hills of Saint Ann. Then if you would prefer a day away from the sea and the sun, there is Mystic Mountain Rainforest Adventures for those looking for adventure tours in Ocho Rios and Runaway Bay. You can soar 700 feet in a chairlift, or Bobsled down the mountain or zip-line through the canopy or combine the three tours. Be sure to bring your camera along for some spectacular shots. 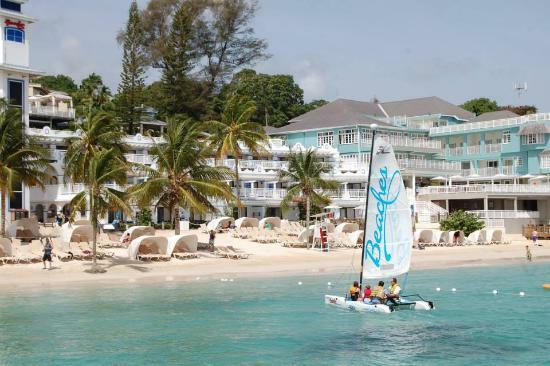 Even if looking for adventure tours in Ocho Rios and Runaway Bay you may not want to leave your hotel and you can decide on land or water sports and choose from tennis, basketball and golf or just go hiking. If you prefer to get wet you may want to go kayaking, snorkeling, windsurfing or to take some scuba diving lessons or have a leisurely ride on a Hobie Cat. Remember we in Jamaica are here to make your stay good fun and filled with happiness.